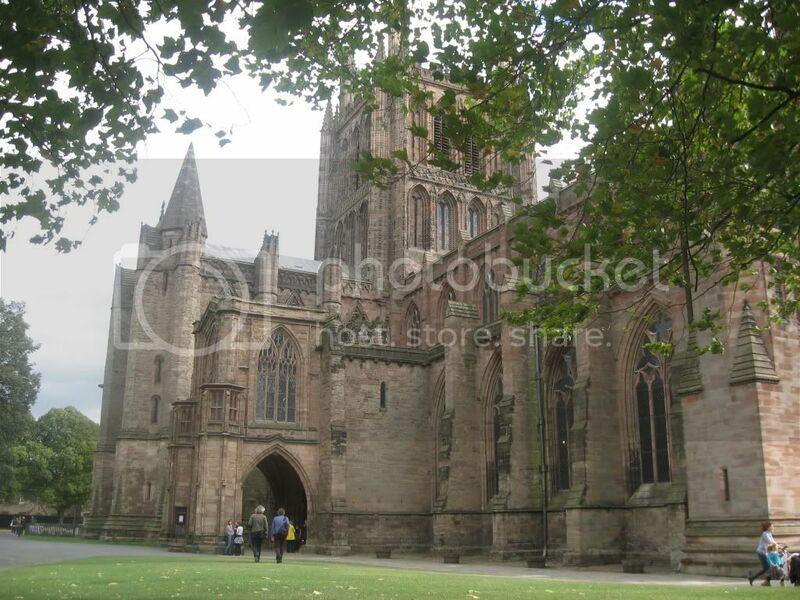 Hereford is a cathedral city which lies on the River Wye, the county town of Herefordshire. The town’s name derives from Anglo Saxon. “Here” meaning an army of soldiers and “Ford” the crossing point of a river, so the name suggests it was a place where foot soldiers crossed the River Wye. The city is essentially a trading centre, manufacturing the likes of nickel alloys, chemicals, leather goods, also dealing in poultry and the cattle trade with the famous Hereford breed. Most important of all is the production of a well known cider, as well as proper beer from the Spinning Dog and Wye Valley Breweries. 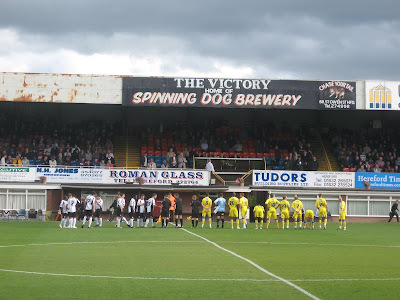 Edgar Street Athletic Stadium has been in use since the late 19th century, primarily for athletics, but also hosted cycling, tennis and of course football. The ground had been home to Hereford Thistle and then Hereford City, who were playing on Edgar Street when two local sides; St Martins and Rotherwas merged in 1924 to form Hereford United. A ground share with City was agreed and the following year saw the construction of a diminutive barrel roofed stand on the Edgar Street side nicknamed ‘Noah’s Ark’ and a tin roofed terrace opposite, known as the Coalshed. The ground was originally owned by the Bulmer family, the brewers of the famous apple based alcoholic beverage, until the local council purchased the ground for £3,000 in 1931. United became sole tenants two years later when City vacated the ground and then ceased playing by the end of the decade. 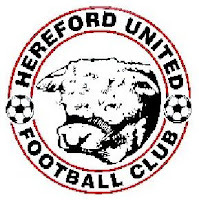 At the turn of the fifties Hereford United became lease holders. They installing floodlights which were donated by local firm Painter Brothers, who specialise in constructing steel towers, their work includes the Skylon which was built for the Festival of Britain in 1951. The floodlights were switched on for a Birmingham League fixture with Walsall Reserves in March 1953, the club illuminating their ground before many of the country’s top clubs. The same decade also witnessed a record gate of 18,114 for an FA Cup 3rd Round tie with Sheffield Wednesday in 1958. The club sold land on the Edgar Street side in 1968 to make way for a road widening scheme. ‘Noah’s Ark’ set sail to nearby Risbury, being used as a barn on farmland and a new cantilever stand with 1200 seats was built on the opposite side. The Merton Stand was then extended when the club progressed in the Football League, replacing the old Cowshed terraces on each side. The stand has a mixture of red and blue seats which includes the family section. The club offices, hospitality, boardroom and changing rooms are underneath the stand, which can be seen through a section of windows which look more like a row of Butlins chalets. The dugouts are brick frames with benches next to a narrow opening, which is the players tunnel. The old wooden grandstand was replaced with The Len Weston Stand, which was named after former benefactor and club president. 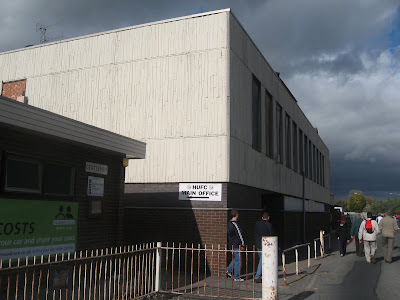 The stand was built in 1974, two years after the club progressed from the Southern League, winning election to the Football League at the expense of Barrow. The stand runs pitch length, there’s a terrace below an upper tier of black seats which gives partial shelter to those standing underneath. The terrace has concrete supporting pillars meaning a restricted view in some areas, while access to the seats is via staircases at the side of the terrace. There’s also a section put by for away supporters at the south side. 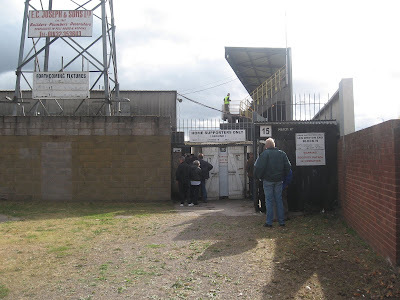 The stand is now named the Cargill Stand and when originally constructed made Edgar Street the only non top flight ground to have two cantilever stands. 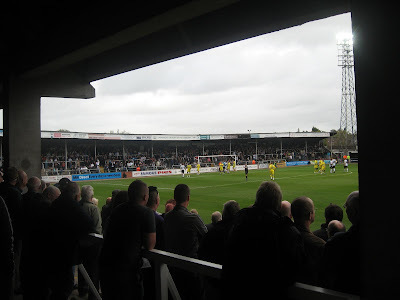 Meadow End has a capacity of around 3,500 and is the home fans singing section. You can see how the ground was once used for athletics as the terrace curves round with a flat section of terracing directly behind the goal. Opposite is a smaller covered terrace at the Blackfriars Street End, which has shown it’s age over recent years, its capacity reduced to 1,000. The terrace is currently closed after failing a health and safety inspection in the summer, but there’s plans afoot to replace the terrace with a 1,500 seated stand. 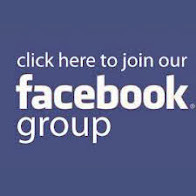 The closure has reduced the current capacity to 7,100. 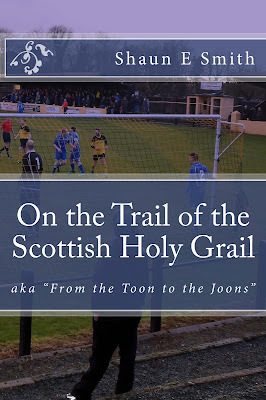 The line “Now Tudor’s gone down for Newcastle” may not mean an awful lot to some, but it’s been the bane on the life of myself and fellow Toon fans for over thirty years. That piece of commentary is etched on my brain, as it’s shown again and again on Football Focus and MotD without fail on the first Saturday in January every year . I’ve got nothing against your beautiful picturesque cathedral city or Hereford United FC, it’s just the word ‘Hereford’ that I despise, it’s like a swear word but with a silent F.
Malcolm MacDonald, blamed the horrible pong from the nearby cattle market for this legendary piece of giant killing, while I personally blame that awful all red strip, Newcastle wearing red! - it just wrong on so many levels. A few weeks ago this game would have been a case of bottom v top, but The Bulls have shown improvement winning their last two home games including an impressive win over leaders Bournemouth in midweek. The game with Dagenham & Redbridge looked to be heading for a dour goalless draw until springing into life with two goals in the final ten minutes. The breakthrough came courtesy of James Walker and was well worth the wait. The striker picked up the ball 20 yards from goal, turned and shot first time past the surprised Roberts in goal, who managed to get a hand to the ball, but the shot proved to be too strong. The goal spurred Dagenham into life, as if they had settled for a point then suddenly realised they were on the verge of defeat. Their next venture forward produced the equaliser. A good run and cross from Green found the incoming Wesley Thomas who headed home from close range. There was still time for a winner and with three minutes remaining Hereford almost snatched it. A through ball found Gwynne who managed to stay onside, but was denied by the legs of Roberts. A draw was a fair result in the end. I was just pleased to see a goal as for long periods of the game that looked highly unlikely. My original plan for today was to watch Gateshead play away at Grays Athletic. I managed to book a lieu day from work, which is a feat in itself and about as rare as hens teeth! However the ever reliable Torchy, who I had booked to travel with had a prior engagement meaning the trip to Grays was abandoned. I looked at the possibility of trains to Essex but they were far too expensive and out of my financial league. Not wanting to waste the much valued day in lieu, I managed to get some decently priced train tickets direct to Birmingham New Street. From there I had the option of Walsall or Hereford, but plumped for the latter so I could tick off another far flung ground. An early start, catching the 7.25 to Brum giving me plenty of time to make the connection to Hereford, arriving there around lunch time. Hereford train station is nicely placed in the town centre, only ten minutes from the football ground with plenty of pubs on route to the match. 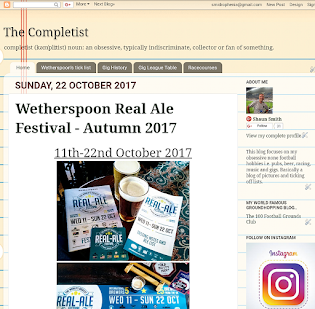 I predictably starting in the nearby Wetherspoons - The King Fee and then on to the recommended pubs; The Victory which is also the base of the Spinning Dog Brewery and the excellent Barrells, both pubs situated on the same road in St Owens Street. I even made time to visit the Cathedral before the match, but unfortunately was unable to gain access, as it was pre-booked for another gig! An enjoyable day out in Herefordshire, where I managed to avoid having to tell anyone of the League club I support, thus avoiding having to be reminded of that fateful day in F’Hereford in 1972. Glad you enjoyed your visit. Red did not hurt us at St James Park where the game also finished all square after 90 mins. Shame no footage survives. 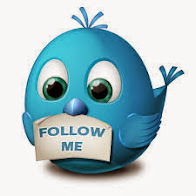 We would so like to have another go.